This is a copy of the speech I gave at the Naas Fianna Fáil convention held at Townhouse Hotel, Naas on 2nd October 2013. Chair, Cllrs., most importantly party members, today is a very proud day for me and my family. It is an honour to have been selected here tonight as a Fianna Fáil candidate for the 2014 local elections. Thank you for your support and special thanks my own Sallins cumann, the Kill cumann, and also all the individual members who nominated me from different parts of the Naas area. 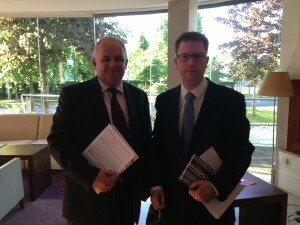 John O’Brien from EMS Copiers with myself at Osprey Hotel recently. A country wide group of small businesses, including Kildare managed copier supplier EMS Copiers, have successfully taken legal action against the government for effectively changing the basic terms and conditions of a public tender after it had been agreed. 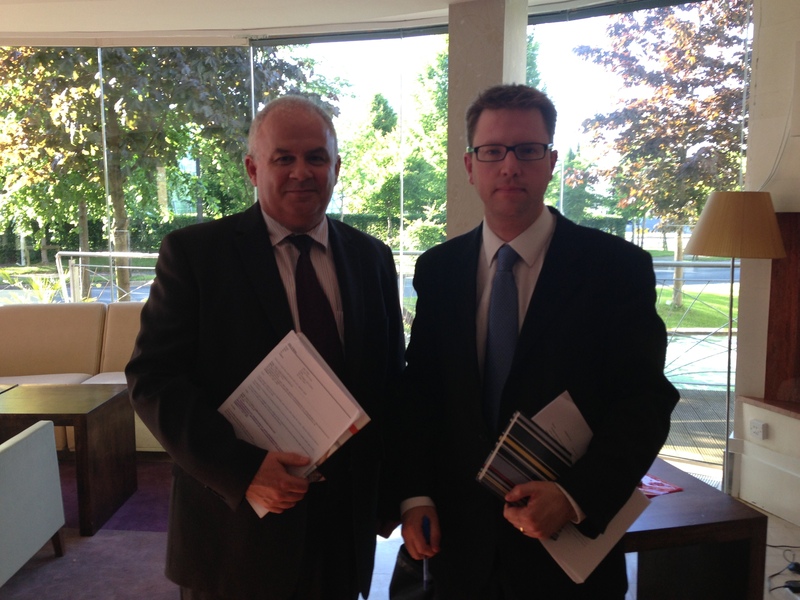 The group instructed James Wall Solicitors based in Clane to challenge the position adopted by the State. 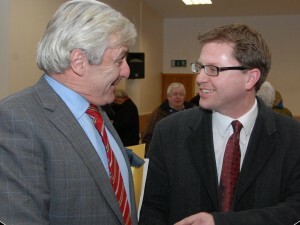 He stated that the case was fully defended at great expense but the High Court agreed with the applicant companies’ position which was that the Minister had no entitlement to interfere with the procedure after it had concluded and as a result rule out the possibility of local businesses doing business with other local businesses. The Court held that any interference was unlawful and therefore ineffective. That ruling is binding on the government but the State has not yet taken any positive action to implement the decision. 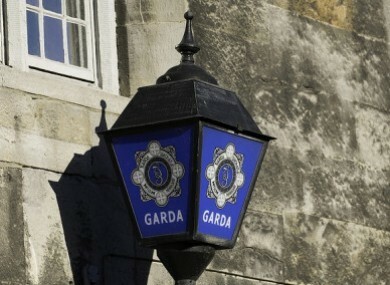 A Garda clinic will commence in Ballymore Eustace starting on August 7th. It will be held weekly every Wednesday from 4-6 pm in the local health centre. Garda Tom is the point of contact for the clinics and can be reached on 0868582695. The clinic has been set-up in response to local concerns following the recent closure of Ballymore Garda station. A number of public meetings were held at the time and a clinic was one option discussed where people could still have a local facility to have forms signed, report crime, seek advice etc. Local Fianna Fáil Representative, James Lawless, has been working with Naas Garda Superintendent, Ian Lackey, to roll out these clinics and he welcomed the opening of the Ballymore clinic. James is also working with the Superintendent to have a similar clinic established in Kill where the village also lost a Garda station this year and James expects to confirm days and times for the Kill clinic next month. As we all know the government shut down Kill Garda Station last winter. There was widespread concern at the time and I organised a number of meetings with senior Gardaí and other interested parties to address this. We are now at the stage of launching a local alert scheme and a first committee meeting was held in Kill last week to get the wheels turning. Alert schemes have proven very successful all around the country and locally in South Kildare in particular has seen some very successful schemes established. The committee is looking for reps from each of the estates and rural townlands around Kill village as they begin the roll out. Please use the contact form below to get in touch with the Community Alert Rep in your area. Three public meetings were held in recent weeks, one in Kilteel and two in Kill, following the Garda station closure, and positive outcomes have been achieved. The meetings were organised by Fianna Fáil’s Naas Area Representative, James Lawless, to allow the community discuss the issues and explore the options. “We have made some progress” said James “amidst concern and alarm at the outset when the village was left exposed, we have now taken steps as a community to advance measures of self-help”.